Ingeborg Syllm-Rapoport earned her PhD this May from the University of Hamburg, successfully defending her thesis on diphtheria 77 years after she wrote it. 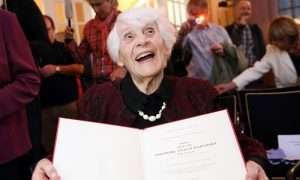 At age 102, this makes Ingeborg the oldest person in the world to ever receive a doctoral degree. The dean of the university’s medical school made extraordinary efforts to help her complete her degree, because she left Germany in 1938 without it through no fault of her own. The Nazi regime prevented anyone of Jewish heritage from ‘academic advancement’ and denied her the right to take the final oral examination. Rather than accept an honorary PhD, Ingeborg brought herself up-to-date on current diphtheria research, and defended her thesis to the academic committee who visited her at home last month. At 102, she accomplished a truly impressive intellectual feat for any age, inspiring people of all ages around the world to never stop reaching for their dreams. Ingeborg finished her research on diphtheria, which was killing tens of thousands in the 1930’s and particularly affected children, in 1938, and submitted her thesis to her advisor. He approved it, but as her paper had a yellow stripe on the cover – for the same reason chilling reason Jews wore yellow stars on their sleeves – she wasn’t allowed to sit for the exam. In a way, she was lucky, as the restrictions and horrors targeting Jews in Nazi Germany were about to escalate. In 1938, once she realized her medical and academic career in Germany was over, Ingeborg emigrated to the United States. Still passionate about medicine and saving children’s lives, she earned her M.D., became a pediatrician, and married another doctor. After having a family, she and her husband moved back to Europe, where she founded then-East Germany’s first neonatology institute. Despite a life of success, service and family happiness, her unfinished degree was always lurking in the back of Ingeborg’s mind. Ultimately, it was her son, a Harvard Medical School professor, who told her story to the dean of the medical school at the University of Hamburg. The dean resolved to right a wrong on behalf of the university and of Germany, and the rest, as they say, is history.